Q: What/who inspired you to start quilting? When I was young I always wanted to be a pioneer, making myself long skirts and sewing a bit. When I was in college I made a duvet cover and a futon cover so my dorm room would be cutely decorated. My first real quilt was made in 2009. I got a sewing machine because I was bored, I didn't enjoy my job at the time, and I needed an escape. My first quilt was a patchwork. It was made without a rotary cutter, just a pair of scissors and not really following the pattern, either. I still have that quilt and cherish it. But, then I discovered the quilting internet....my first online tutorials were from Alison Harris at CluckCluckSew. I still enjoy her quilt patterns for fun and easy-to-follow instructions. From there I went off the deep end. While I was doing the easy pattern from CluckCluckSew, I also thought, "I really like that Dresden Plate my parents have...I'll make that!" To the internet I went, and those two quilts were both finished around the same time. I love my Dresden Plate and it is still one of the quilts I'm most proud of. From there I found guilds. I've had to move for work multiple times and the first thing I looked up was where my local Modern Quilt Guild would be. I met the PMQG within a few weeks of moving to Philadelphia, and they welcomed me and made me feel at home. At my first meeting I was put in charge of a committee, and since then I've been Treasurer and now Co-President. I love my quilting friends and family at PMQG and the MQG. Q: How do you organize your fabric and scraps? All of my sewing supplies are stored on the landing of our stairs. My fabric is organized in an IKEA Kallax shelf; everything over a yard is stored folded up and organized by color/size/collection. Sadly right now everything less than a yard is shoved into one cubby and, of course, on the floor! Must get cleaning, but that's not as fun as sewing! Q: What color palette do you gravitate towards? As everyone in the guild knows, I love aqua/orange/pink/blue. Pretty much all of my quilts are in that same general palette. My favorite combination lately has been mustard/berry/navy. Q: What is the most challenging quilt you have attempted? Q: What is your favorite quilting tool? I'm pretty basic. I don't buy many fancy gadgets; I'm more of a figure-it-out-myself kind of gal. But I can't live without my rotary cutter, small mat, ruler and flatter!! Q: What project are you currently working on? I'm working on becoming a better machine quilter. I'm working between my domestic Singer and renting Long Arm time at a local quilt shop. I'm also working on finishing up a long overdue WIP [work in progress] of the Shimmer Pattern from, surprise surprise, CluckCluckSew. Q: Do you name your quilts? I only name my quilts when I have to....like for Quilt Shows, and it typically takes me forever to decide on a name. Q: Do you label your quilts? How? I sometimes put a label in the binding of my quilts, but not always. Stay tuned for another Member Spotlight coming soon to the blog! You're Invited to Our Annual Fall Retreat! 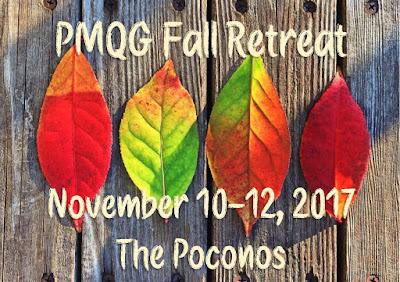 The Philadelphia Modern Quilt Guild is hosting our annual Fall Retreat from November 10th-12th at The Chateau ​Resort and Conference Center in the Poconos. Hotel Information:The Chateau is located at the base of the Pocono Mountains at 475 Camelback Rd, Tannersville, PA 18372. Our room block has a rate of $116.10/night, for a two night stay, Friday-Sunday. More information about The Chateau can be found on their website here. Retreat:The fee for non-members is $90 for the 3 days. Currently, all meals will be on your own with a local restaurant list provided. As always, snacks and goodies are always welcome! We will be hosting an exchange of Retreat Survival Kits that will consist of the 1-Hour Basket with any assorted goodies that you wish to give to your recipient (tea, candy, chocolate, sewing goodies), spending no more than $15. If you wish to participate please indicate that on the registration page, and you will be matched up with a fellow attendee ASAP. The sewing room at the retreat is the Seasons Ballroom, which has 2 walls of beautiful windows. The room will open at 9am on Friday, November 10th and will remain open until 4pm on Sunday, November 12th. If you wish to join us please register here. Confirmation of your retreat will first be sent out on August 1st and then on a rolling basis, based on space available. If you have any additional questions please email me at Jordyn.rush@gmail.com. We hope you can join us in November!